Chances are you’ll find many other uses for this fragrant sweet-tart jam. Enjoy it on a grilled-cheese or ham sandwich or serve it with a cheese or charcuterie board. It’s the perfect complement for fresh goat cheese or a tangy Cheddar. Pair with your favorite Temecula Valley Cabernet Sauvignon or Syrah. Put the figs in a small saucepan with 1 cup (8 fl oz/250 ml) water. Bring to a simmer over medium heat and simmer for 2 minutes. Cover and set aside for 30 minutes. Heat the olive oil in a large skillet over medium-low heat. Add the onion, thyme, and fennel seed. Season with salt and pepper. Cook, stirring often, until the onions are soft, golden-brown, and sweet, about 30 minutes. Lower the heat if necessary to prevent burning. While the onions cook, prepare a medium-hot charcoal fire or preheat a gas grill to medium-high. Lift the figs out of the liquid with a slotted spoon and slice thinly. Add the figs to the onions, along with the sherry vinegar and 2 tablespoons of the fig-cooking liquid. Cook, stirring often, until the liquid has been absorbed and the flavors have merged, 3 to 4 minutes. Taste for seasoning. The jam should be moist with a balanced sweet-tart flavor. Grill the sausages until they are nicely browned all over and feel firm when probed, about 10 minutes. Serve immediately with the warm jam. Bel Vino Winery ~ Cabernet Sauvignon Vintners Selection – Aromas & flavors of black cherry, plum and dark chocolate. Callaway Winery ~ 2014 Winemaker’s Reserve Syrah – Dark, spicy and brimming with black fruit, this vintage will only get better with time. Danza Del Sol Winery ~ 2014 Syrah – Flavors of ripe black cherry, plum and hints of chocolate and tobacco laced finish. Braised sweet peppers, potatoes, and tomato make a succulent foundation for baked fish. Sauced with a garlicky, saffron-scented aioli, the dish needs only some crusty bread to complete it. Pair with your favorite Temecula Valley Grenache Blanc or Rosé. Heat the olive oil in a large, wide Dutch oven over medium-low heat. Add the onion, potatoes, tomato, peppers, parsley, oregano, saffron, and 2 teaspoons salt. Cook, stirring occasionally, until the tomatoes render their juice and the vegetables begin to soften, 10 to 12 minutes. Add the wine and simmer for a couple of minutes to evaporate the alcohol. Cover the pot and adjust the heat to maintain a gentle simmer. Cook, stirring occasionally, until the potatoes and peppers are tender, about 20 minutes longer. Stir in the olives. Taste for salt. Season the fish with salt and place the fillets on top of the bed of vegetables. Add ¼ cup (2 fl oz/60 ml) water, cover and cook until the fish just flakes, about 10 minutes. While the fish cooks, make the aioli: In a mortar, pound the garlic and a generous pinch of salt to a paste; alternatively, mince to a paste by hand. Put the egg yolk in a small bowl, add a splash of lukewarm water, and whisk. Begin adding the olive oil gradually—drop by drop at first—whisking constantly. (Recruit a helper to pour while you whisk.) When you have achieved an emulsion, you can add the oil a little faster. When you have incorporated all the oil, whisk in the garlic paste. When the fish is ready, tilt the cooking pot and draw off about ¼ cup (2 fl oz/60 ml) of the juices. Whisk enough of these flavorful juices into the aioli to make it thin enough to drizzle. Taste for salt. With a spatula transfer the vegetables and fish to individual shallow bowls or plates. Spoon aioli over the fish. Garnish with more chopped parsley. Chapin Family Vineyards ~ Rosella Rosé – Delicate flavor with a hint of grapefruit and a slightly dry and crisp finish. Hart Winery ~ 2016 Rosé of Sangiovese – Lightly pink, near-dry, delicately scented and flavored Rose′ wine, very much in the dryer, food-friendly European style. Palumbo Family Vineyards & Winery ~ 2016 Grenache Blanc – Green apple and mandarin orange dominate with citrus peel with herbal notes in the mix. 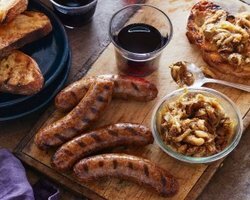 This looks like an amazing dish to serve for your 4th of July BBQ! Fresh cherries round out the smoky heat of a feisty barbecue sauce that glazes tender pork ribs as they crisp on the grill. Pair with your favorite Temecula Valley Zinfandel or Cabernet Sauvignon. Heat the oil in a medium saucepan over medium heat. Add the onion and sauté until softened, about 4 minutes. Add the jalapeño and garlic and sauté until fragrant, 1 to 2 minute. Add the remaining ingredients, bring to a boil, then reduce the heat to low and simmer until slightly thickened, about 15 minutes, stirring occasionally. Transfer the sauce to a food processor or blender, process until smooth and taste for seasoning. In a small bowl, combine the rub ingredients. Evenly coat the ribs with the rub. Let stand at room temperature for 30 minutes. Prepare the grill for indirect cooking over medium-low heat (about 300°F). Grill the ribs, bone-side down over indirect heat, with the lid closed, until the meat is very tender, 2 1/2 to 3 hours, turning occasionally to ensure even cooking. During the last 20 to 30 minutes of grilling time, baste the ribs with the glaze every 5 or 10 minutes. Remove the ribs from the grill and let rest 5 minutes, then cut into individual ribs for serving. Combine all of the slaw ingredients in a large bowl and toss to thoroughly coat. Cover and refrigerate for at least one hour to allow the flavors to develop. 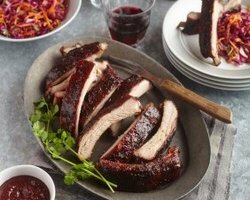 Serve the ribs with the remaining sauce for dipping and the slaw. Baily Winery ~ 2014 Cabernet Sauvignon – These grapes hail from the oldest vineyards in Temecula, planted in 1968. This wine offers warm, rich tones with subtle, herbaceous qualities and a hint of mint. Doffo Winery ~2015 Zinfandel – Awarded 1st place at Temecula Valley People’s Choice Blind Tasting! Leoness Cellars ~ 2015 Cellar Selection Zinfandel – This wine offers beautiful aromas and flavors of sweet blackberry and juicy plum, with hints of clove and black licorice framed by soft tannins and a long, silky finish. Thornton Winery ~ 2014 Cabernet Sauvignon – Very classic berry and pepper aromas came forth while subtle herbaeceous notes meld with the warm toasty aromas from the oak. Barbecues are a great way to enjoy the outdoors and celebrate the day with Dad. And all that grillin’ just screams for a good red wine. But if you’re thinking it’s too warm for red, think again! 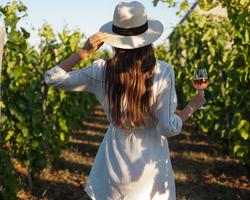 With these few tips, finding the perfect summer sip won’t have to put your love of red on hold. Chill out! 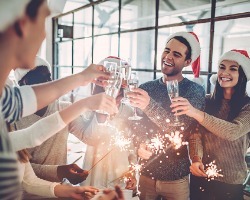 Pop your bottle of red wine in the fridge for about 30 mins – or in an ice chest for about half that – and you’ll be amazed at how much more refreshing it will taste. No or Low Oak wines are generally fresher and fruitier. 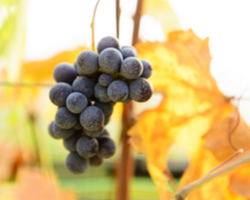 Low to Moderate Alcohol levels usually equate to lower tannin levels for a wine that won’t weigh you down. Light to Medium bodied wines tend to be easy on the palate, bright and light. So, whether you’re in the backyard or on the beach – serving burgers and brats, or steak and grilled veggies – there’s tons of options for pairing your favorite Temecula Valley wine with whatever you’re serving up. 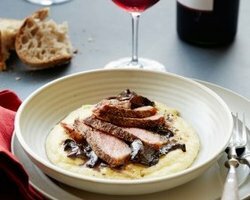 If the mainstay is red meat, a spicy Zinfandel or Syrah would be perfect. If you’re looking for a more mellow choice, a fruit forward Merlot always works; it’s also great with chicken, pork chops or fish. If your fave is a Cabernet, go ahead and drink what you like. But try not to shortchange your options. Go for a nice red blend for the best of all worlds. And don’t forget about a blush wine; there’s nothing a nice dry rosé can’t do for spicy ribs and coleslaw – or a plate of spicy hot wings! 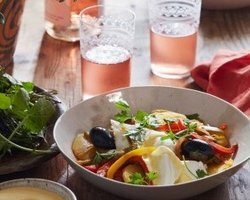 Posted in Wine Pairing Guide | Comments Off on Summertime Sipping! Crisp, creamy and peppery, these sandwiches make a spectacular simple supper or decadent late-night snack. For the perfect pairing, try with your favorite Temecula Valley Zinfandel or Sauvignon Blanc. 1. Toss to mix the Fontina, Jack, and Gruyere cheeses in a medium bowl. 2. Use your fingers to pinch 2 small holes, 2 inches apart, in each slice of bread (to allow a little cheese to ooze out and make the bread extra crispy). 3. Spread a thin layer of butter on one side of each slice. 4. Arrange 4 of the slices, butter-side down, in a large skillet. 5. Cover each slice evenly with a quarter of the cheese mixture. 6. Cover the cheese with a quarter of the watercress. 7. Top the watercress with the remaining slices of bread, butter-side up. 8. Place the skillet over medium-low heat and cook the sandwiches for 8 minutes, or until golden brown on the bottom. Turn the sandwiches and brown the other side. 9. Transfer the sandwiches to a cutting board, turning them so that the watercress is on top of the cheese. 10. Mix the mayonnaise with the mustard to make the aioli. 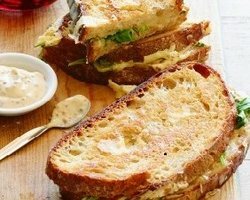 Remove the top slices of bread and spread the unbrowned sides with the desired amount of aioli. Replace the bread, brown-side up, on the sandwich. Serve immediately. 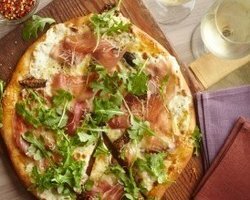 Caramelized figs, oozing cheese, salty prosciutto, and fresh arugula are a delightful combination of flavors and textures in this pizza. Pair with your favorite Temecula Valley Riesling or Rosé. Place a pizza stone on the lowest rack in the oven, and heat the oven to 475°F. Divide the dough into 2 equal balls. Roll each ball out on a lightly floured work surface and transfer to a lightly floured pizza peel (or roll out on a piece of parchment paper). Lightly brush the dough with olive oil. Sprinkle the rosemary over each crust, leaving a 1/2-inch border around the rims. Arrange half of the mozzarella over each crust, sprinkle 2 tablespoons Parmesan over each pizza, and arrange the figs on top. Slide the pizzas onto the baking stone (if using parchment, slide the parchment onto the baking stone). Bake the pizzas until the cheese is melted and the crust is golden brown, about 15 minutes. Remove the pizzas from the oven. Drape half of the prosciutto slices over each pizza and sprinkle 1 tablespoon Parmesan over each pizza. Return to the pizzas to the oven, and cook until the prosciutto is heated through, 2 to 3 minutes. Remove the pizzas from the oven and scatter half of the arugula over each pizza. Brush the crusts with olive oil, sprinkle a few drops of olive oil over the arugula, and garnish with black pepper. Cut the pizzas into wedges and serve immediately. Baily Winery ~ 2016 Riesling – Enjoy this delicate, dry and fruity white with a slightly spicy meal, or poolside on a hot & sunny day! Hart Winery ~ 2016 Rosé of Sangiovese – Lightly pink, near-dry, delicately scented and flavored Rose′ wine, very much in the dryer, food-friendly European style. Excellent with a wide range of foods, and a great summer sipper. Maurice Carr’ie Winery ~ 2016 Riesling – This semi-sweet Riesling is full of apple and apricot aromas. The palate is nicely balanced between crisp, fruity, acidity, and modest sweetness. Flavors of apricot, pear, peach, and pineapple develop in this rich wine. These crab cakes are fresh, delicate and lightly bound with baby shrimp, which amplify the crab’s natural sweetness. Pair with your favorite Temecula Valley sparkling wine. In a food processor, pulse the shrimp to a coarse paste. Transfer the shrimp to a large bowl, add the 1/4 cup panko and the remaining crab cake ingredients. Gently mix to combine. Pour 2 cups panko into a shallow bowl. With wet hands, gently form the crab into 2-inch patties, about 3/4-inch thick. Carefully turn the patties in the panko to lightly coat, place on a plate and refrigerate for 1 hour. In a small bowl, whisk the aioli ingredients. Heat 2 tablespoons oil in a large skillet over medium heat. Add about half of the crab cakes, without overcrowding the pan, and pan fry until golden brown on both sides, 8 to 10 minutes, turning as needed. Transfer to a plate and repeat with the remaining crab cakes. Keep warm while you assemble the salad. Cut a slice off the tops and bottoms of the orange. Use a sharp knife to cut away the peel and white pith. Working over a bowl to catch the juices, slice out the orange segments from their membranes. Place the segments in a large bowl and squeeze as much juice as possible from the membranes into the bowl with the juices (there should be about 2 tablespoons). Add the fennel and watercress to the oranges. Drizzle the juices and the olive oil over the salad, lightly season with salt and pepper, and gently toss. Mound the salad on 4 serving plates and garnish with the chopped chives. 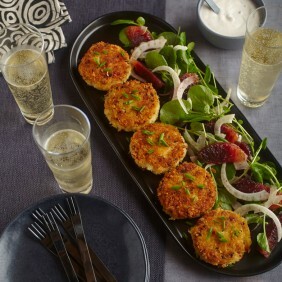 Arrange 3 crab cakes next to each salad and serve with lemon wedges and the aioli for dipping. South Coast Winery Resort & Spa ~ Crisp acidity and delicate yeastiness are enveloped in a rich tropical fruit aroma. Thornton Winery NV Brut ~ This Non-Vintage Brut is a blend of primarily Chardonnay and Pinot Blanc, giving the wine exciting, crisp fruit characters.